A sample pack containing all 14 of our standard stain colors on Red Oak! - The price on this sample pack includes a coupon to apply the full purchase price of this sample towards a future order with us. Order a sample pack containing all 14 of our standard stain colors! Sometimes it's just best to see colors and finishes in your home's lighting conditions and to compare stain colors to flooring colors first-hand - this sample pack is the perfect way to do this! This sample pack includes a roughly 2" x 3" cutting of Red Oak stained in our standard stock colors. Each wood chip is a finished square of 3/8" thick Red Oak that is stained and finished in the same manner and using the same stains and finishes as our prefinished stair treads and risers. 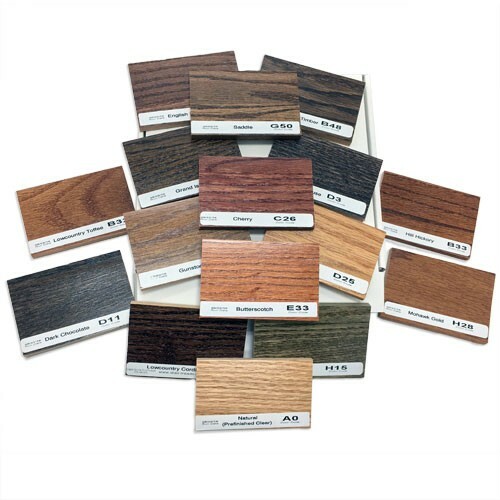 With a cutting of each sample board, you can see each color and compare it to you existing flooring! If you are trying to decide which color is for you, ordering this sample pack is the way to do it! Did you know you can see a list of stain colors online? You can see a comparison of stain colors on our Stain Colors page. I have bruce wood hardwood engineered floors in the gunstock finish. I want to match the stairs to that new flooring. Can I send you a piece of the wood flooring to have you choose the matching gunstock to the floor I already have? Bruce has several different products that use the same stain names as our products - in our experience, these flooring lines are not all the same color, however (i.e. Bruce's Dundee Plank, Gunstock and Bruce's Natural Reflections, Gunstock are two completely different colors). Our stains may crossover to several of Bruce's colors but the only way to be certain is to compare our stain colors with your particular hardwood flooring. Other flooring brands use similar names as well and our colors match many of these brands. We strongly encourage you to verify the colors first-hand before placing an order because all colors do vary slightly from run-lot to run-lot on the flooring as well as our treads. We do have a small charge for all our samples to help us cover the shipping costs but we include a coupon with every sample pack to refund those costs and encourage you to confirm the stain color before ordering. We do offer a custom color match program but there are additional costs and set-up fees associated with this program - if you would like to explore this option, please contact us (http://www.stair-treads.com/contacts/ ) directly with your requirements. Are these finished with the same finish that will be on the stair treads as far as color and gloss? Yes - these samples pieces are cut from larger panels that are finished using the exact same staining and finishing techniques as any production order. The gloss level and coloring on these samples will be the same as a production order of stair treads and risers. You said we would receive a coupon that would apply the cost of the sample pack to an order. What are the restrictions to applying the coupon to our order? For example, is there a minimum dollar amount to our order for us to be able to deduct the cost of the sample pack? The only restriction to apply the coupon cost towards a future order is the order must be equal to or grater than $300 before any shipping costs or discounts. The coupons also have an expiration date which is typically the end of the calendar year but never less than 3 months. I would like to use retro T&R to replace the existing stairs. Is my only option Oak? I have mahogany floors and wanted the grain/wood specie to match. Also, my first step has a right turnout.. Is there a retro riser and tread available? Nearly all our treads and risers are available in over 23 different species including Santos Mahogany. Some of the profiles may not be displayed online and if you'd like assistance with material quotes, please feel free to contact us with specifics on your project so we can help. Need to match Home Legend Maple Saddle. Doesn't need to be hand scrapped. I would start with a sample pack. If nothing in the sample pack matches, you can still use the coupon, and we can try another option to get the treads to match whatever you are comparing the treads to! I have one step that is 14" deep which with a Retro Riser would put it out to almost 15" deep. Can I get that one tread at a special depth or is there a work around? We can quote custom dimension treads. Please contact us at 1-866-429-979. We will need a photo or drawing and dimensions of the custom step. I did not see any instructions on how to finish the landing. What do you suggest? We also offer risers, moulding, and stair parts in Brazilian Cherry. If you have any trouble finding a product, please don't hesitate to let us know and we'll be happy to help. You can also send us a list of parts and sizes and we'll be happy to create a quote based on your particular needs. I would like to have the Brazilian Cherry retro treads stained, but it looks like you only offer that for the Red Oak? Can I custom order stair-tread with rounded edges with a specific radius? And if you need a starting step with different dimensions, contact our sales team with your requirements and they can provide pricing and availability based on your requirements. The sample packs should include a card with a code that you can enter during checkout that will automatically add the discount to you order - if you can't find the code on the coupon or have trouble applying the discount, please feel free to call us and we'll be happy to assist you over the phone. We do not have examples of the treads with carpet down the center. You can install carpet on top of the full wood tread, or cut the tread and have 2 separate pieces and then carpet in the center. Can I order a boxed end tread with one end mitered at 45 degrees turn of approx. 10 inches? For custom products please send in a drawing with the dimensions to sales@stair-treads.com, we can get a quote put together with the cost of custom products. Isn't the landing tread going to make the landing 1/4" higher than the rest of the treads if the retrotreads are 1/2" thick? Also is there options for the "butterscotch " stain to be viewed on different wood samples beside the red oak? I am trying to match some cabinets that are called butterscotch but the type of wood they are constructed from eludes me. This looks like a great product. I have always wondered how I could convert my stairs from carpet to wood and still meet code without having to totally rebuild the stringers. Both our landing tread and our retro treads are 3/4" thick along the body of each profile. We can make a thinner tread (1/2") but only by special order. In our experience, the thinner treads are prone to warping and cupping. We can apply the same stain color to other species such as Maple, Birch, or Poplar. We also have a custom stain program available for an additional cost. If you would like, take a couple of photographs or your cabinets and e-mail them to us. We can usually offer some suggestions based on photos. How long does it take to receive these samples? We ship the samples the same, or next day that they are ordered. It takes 3-4 business days to arrive, depending on your location. After the top stair tread, I am installing carpet. How does the carpet fit snug to the tread? The last step, that transitions into carpet, you will want to install a landing tread. This piece is 5 1/4" wide and has a groove in the back. The carpet will fit into the groove perfectly. You can see the landing treads at the link below. What is your guarantee on the finish on the retro treads (how many years) and can they be refinished? We do not have a guarantee on the finish of the treads, because the treatment of the treads determines how long they last. If you keep them clean the life span is about 25-30 years (or longer). We do have a warranty of the actual structure of the treads. The treads can be refinished many times, since they are solid wood, 3/4" or 1" thick!